I missed the frenzy around Dan Brown's best seller last year, The Da Vinci Code recommended by a respected Zen Buddhist teacher in Sweden--before all the media frenzy. All last summer my friends spoke about it in Skala Eresssos on the island of Lesbos on my holiday for it takes up how Mary Magdelene may have been one of the disciples of Jesus . I even bought the book which awaits my scrutiny. Tonite, the film adapted from the book will open the Cannes Film Festival. I saw it several hours earlier today. I am glad I saw the film before I read the book. Because as filmmaker Maya Deren declares: if cinema is to develop its own language it must create a vocabulary of filmic images. It should reject horizontal linear development and create vertical cinematic time and space. That said, Ron Howard's The Da Vinci Code is a horizontal potboiler. There are few instances of cinematic magic. Granted there are several teams that worked on special effects , with colorful code names such as Brainstorm Digital, Double Negative, Rainmaker and The Senate. However, there is little to conjure up "sacred symbols of the feminine" even if the mystery concerns tracing theories about the history of Mary Magdelene. Howard said the theme fascinated him because he has a strong willed wife and three daughters. But this is not the theme of this film. Its an ordinary crime mystery saga, like the novel, with lots of detectives, preyed upon innocents and arch enemies.In just the opening minutes of the film I was confronted by the profundity of the following "symbols". Robert Langdon (Tom Hanks) is giving a lecture in Paris. He asks - in English - what certain symbols mean for the students. They answer all too quickly like a cadre of Harvard hotshots, nearly all in English. This does not happen in Paris student lectures. Students are contemplative and take their time responding, however brilliant. Granted in the book these are students at the American University in Paris, but in the film, these are French students, admonished to speak in English. The lecture has changed title from "The Symbology of Secret Sects" and "Ideograms"--to the "Sacred Feminine". The precipice of the film, with little to show for it. 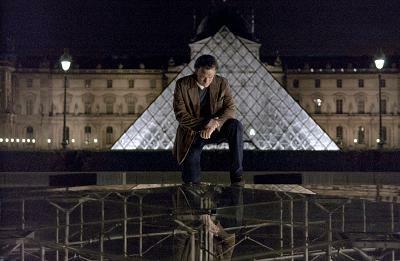 Later, Bezu Fache (Jean Reno) of the Paris police, questions Langdon about what the symbols mean on the chest of the dead curator of the Louvre - Jacques Saunière (Jean Pierre Marielle). Right in the middle of a book signing in Paris. This kind of public ventilation of the details of a criminal investigation ----just does not happen..... Then, we only get to hear about 10 seconds of Serge Gainsbourg's La Javanaise (The Javanaise Woman) on the taxi radio when Robert is left off at the Louvre to meet Fache and observe the curator's body. Quel dommage! 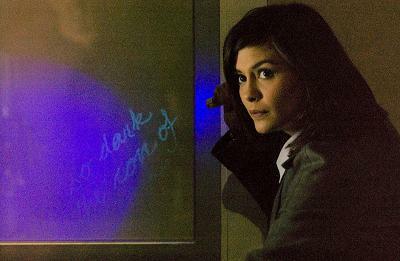 History: Sophie Neveu (Audrey Tatou) , a French government crytographer doesn't like history but Harvard professor Robert Langdon (Tom Hanks) says that is because she may not like "her story". Considering the fanaticism around The Da Vinci Code maybe we would like our history better if it were not surpressed and buried. So, who killed her grandfather, the curator at the Louvre. The symbols on his chest and several anagrams and cryptic numbers reveal a story of power in the Christian Church. His death comes after he assumedly reveals the location of the keystone to the Holy Grail to Silas (Paul Bettany), a deranged flagellator - or did he? The stone marks the site of the "best kept secret of the Catholic Church", on the "Rose Line", a Prime Meridian that passed through Paris before the Greenwich Median was established. Hence an old rivalry is evoked of the two neighbors on the English Channel. In order to present the historical arches of Brown's novel several scenes are rather quickly recreated from biblical and early Christian history - including the modern operations of the Priors of Sion, a "secret" gnostic brotherhood, and the ultra-conservative Catholic sect Opus Dei. which includes Bishop Aringarosa (Alfred Molino). To impart a dated feel to the material, these scenes are blurred, including a fuzzy mass of departed souls ascending the steps of the Temple Church in England. The history of Sophie's grandfather, is given ample room. He was one of the Priors of Sion. She was unknowingly groomed as an apprentice until a fallout. But more is revealed. In the end when Robert cuts himself shaving and the blood forms a Fleur de Lis in his Ritz hotel room sink, he realizes that the Rose Line goes from Rosslyn Chapel in England (which took only 40 years to build!) to " the scar of Paris" as Bezu Fache calls it-- IM Pei's pyramid outside the Louvre. It turns out the Holy Grail is none other than the remains of Mary Magdalene, a real threat to the patriarchal order of the Church. This makes sense when we realize how many thousands of women were burned at the stake and executed with the dawn of Christianity and the bloody Crusades. Da Vinci offers us the clues. 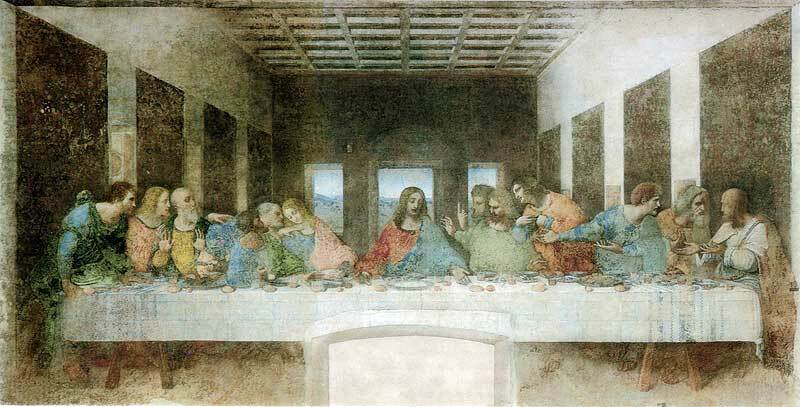 The chalice or Holy Grail is Magdelene's womb, the vessel of the blood of Jesus, symbolized in the emptyV-shaped space between Mary Magdelena and Jesus in Da Vinci's Last Supper(shown above). Inversely, each V-stripe on the soldiers of military officers is a male symbol, declares Sir Leigh Teabling (Ian McKellan), a Grail scholar, who cunningly use Robert and Sophie for his own selfish purposes in his quest for the Holy Grail. "I never knew a girl whose grandfather gave her a cryptex. My grandfather gave me a wagon". Langdon to Neveu. Lines like these create little chemistry between the two characters and are notable throughout the entire film. Sophie's "grandfather" and "grandmother" indulged in rituals of the Priors where men and women recreate the carnal passion of Jesus and Mary Magdelena. This scene is reminiscent of Kubrik's desparate Eyes Wide Shut when Tom Cruise disguises himself and observes masked men and women in ritualized orgies. Sophie on a surprise visit home as a college girl quickly cuts her ties to her grandfather after witnessing this event. Clipped at the wings in Howard's adaptation is a rich pageant of esoteric knowledge and French history. Beneath every calling card is a better, truer story. Brown may have been sued for plagiarizing the novel, but the information is out there in the public domain for modern tropes, however twisted. Sir Isaac Newton was famous for his scientific inventions but left the ultimate interpretation of them to God. Now that's gravity. Mona Lisa by Leonardo DaVinci is a very small portrait kept under glass at the Louvre and is strictly forbidden to be touched or photographed. Another Leonardo worthy of mention is Leonardo Pisa Fibonacci whose numbers were a roadmap to sacred places, possibly even the tomb of Mary Magdelene, if such a place indeed exists. His numbers were used to calculate immaculate conceptions. In this film they are superficially used to access a Swiss bank ing vault. The "Fleur de Lis" (introduced in The Da Vinci Code as a pendant left at the Louvre by Jacques Saunière) is the symbol of the Virgin Mary and was used by the Kings of France. The earliest were the Merovingians who established the City of Paris on a vortex point, Rose Line if you will. They also worshipped the goddess Diana. Pont and Place de l' Alma are the sites of underground chambers of worship in her name. Below Place de l'Alma Princess Diana was killed in a tunnel. (Briefly, Ron Howard shows a car ride in a tunnel- and The Ritz where Diana was moments before). The Fleur de Lis is adorned on French churches. The unoffical tour of the Notre Dame de Paris, not sanctioned by the Catholic Church has information with Fleur de Lis prominantly displayed. Hoards of tourists climb the steps to the tower of the Notre Dame. Here if they know what to look for, they will find two languages in stone - one esoteric, such as a statue of an alchemist, a pelican and an elephant and the other Christian, with all the saints and Jesus. At the bottom of the Great Port is a woman-the sacred feminine indeed, holding a book of esoteric and exoteric knowledge, and a series of stone carvings of the stages of alchemy described by Fulcanelli. 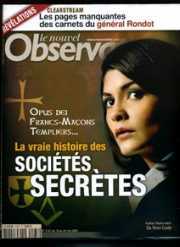 Secret societies of freemasons and alchemists historically met in the Church honoring these stones. France has a powerful history of esotericism, much carved in stone, and is awaiting cinema for worthy explorations. Ron Howard's The Da Vinci Code does not do it very well. Here's the key to understanding the esoterica the movie and book left undefined. In the process, you'll understand why it was left for me to explain. You may not initially agree with everything I reveal, but be a little patient with my long-winded presentation of what I have waited a very long time to be able to say. I promise to amaze and enlighten. There's much more to the story of the Vatican's recent machinations than meets the eye. It's not the DaVinci Code or Gospel of Judas per se, but the fact that people have now been motivated to seek out the unequivocal truth about an age of deception, exactly when they expect me to appear. These recent controversies are spurring people to reevaluate the Vatican/Papacy and the religions that Rome spawned, at the worst possible time for them. Remember, "I come as a thief..." ? It is beyond amazing that the Vatican still tries to insist the Gospels are the literal truth. Every miracle purported for Jesus has multiple direct symbolic parallels in the Old Testament, Apocalypse, Dead Sea Scrolls, and other symbolic narratives and traditions. Recasting the symbolism of earlier Hebrew texts as literal events in the New Testament is one of the central deceptions associated with Christianity. This is part of the secret knowledge held by the ancient Gnostics, Templars, Cathars, and others, which is presented with dramatic effect in the DaVinci Code. None of these narratives or stories were ever intended as the literal truth. This fact is the key to unraveling many ages-old mysteries and exposing the truth about the Vatican's long-term deceptions. Moreover, the following Washington Post article (The Book of Bart) describes how many changes and embellishments were made to New Testament texts over the centuries, unequivocally demonstrating they are not original, infallible, or truthful. When you combine proof that the New Testament Gospels are not wholly literal with proof that these texts were heavily reworked in the early years of Christianity, you are left with only one possible conclusion. The Vatican has long lied to everyone about the central tenets and history of Christianity. This revelation also proves they are not the Creator’s representatives but Her longtime opponents. The recent hoopla over the Gospel of Judas and DaVinci Code demonstrates they are still desperately trying to deceive the world and obfuscate their true nature and activities. It's no wonder the Vatican fears the truth more than anything else. As further proof of these assertions, seek to understand the symbolic significance of my name (Seven Star Hand) and you will have proof beyond disproof that Jews, Christians, and Muslims have long been duped by the great deceivers I warned humanity about over the millennia. What then is the purpose of "faith" but to keep good people from seeking to understand the truth? The film really haunted me for a reason I cannot tell. I guess there is more about Christianity that has been hidden from us. or what if that where true. have against this film ? really has to hide ?